It is a large and splendid church of the Perpendicular style, with large windows that were undoubtedly filled with magnificent stained glass. The N Chapel contains monuments of the Denton family whose large Mansion was just to the east of the church. 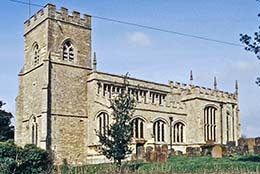 The remote Hillesden House and Church became an outpost of Royalist forces during the Civil War, being attacked twice by Parliamentary forces, including Oliver Cromwell in 1643. The house was destroyed and the church suffered badly, particularly most of its glass. In the 1820s, Hillesden church was a young George Scott's favourite place to visit and study. In the 1870s he fittingly returned to restore the church that had inspired him to become the prolific architect Sir George Gilbert Scott. 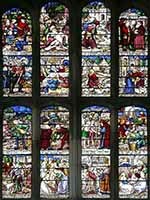 There is no precise date for any of the glass, however it was very likely to have been fitted in the rebuilt church on completion in 1495. Experts are certain that it dates from the reign of Henry VII, so to be sure it is generally termed as 16th century glass. The E window of the S transept has a lot of old glass that somehow survived, and we show it in great detail, together with 1875 drawings showing which parts had already been replaced by non-matching glass.